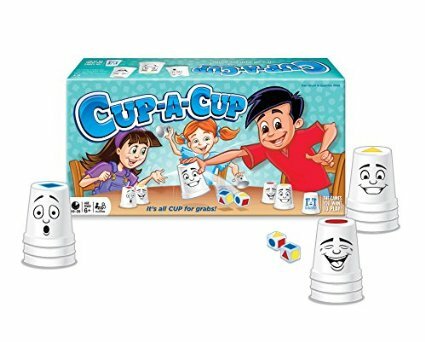 Cup-A-Cup is a fun, clever way to work on visual processing and response speed. Game includes 9 cups each with a circle, square or triangle, in blue, yellow or red, printed on the bottom. The two dice are marked with those same shapes and colors. So the object is to be the first player to grab the cup whose bottom shape completes the set indicated by the throw on the dice. If a red circle and a red square are thrown all players should be racing for the red triangle cup. And if a yellow square and blue triangle are thrown, be the first to pick up the red circle. First person to collect 4 cups is the winner! After the game is over, try stacking the cups. It is a fun and very motivating way to build arm, shoulder and trunk stability and control.